Let us take the stress out of selling. Simply speaking, staging is the art of preparing your home for sale. At Spruce, we offer full service staging, ranging from a two hour "walk and talk" consultation to full staging with furniture and accessories. Today's buyers have high expectations when they are looking for their next home. At Spruce, we help you bridge the gap between what your home has to offer and what buyers want to see when they cross your threshold. We know you're busy. Let us help by getting you organized, prepared and decorated to sell. If we can relieve some of your stress, we know we've done our job. 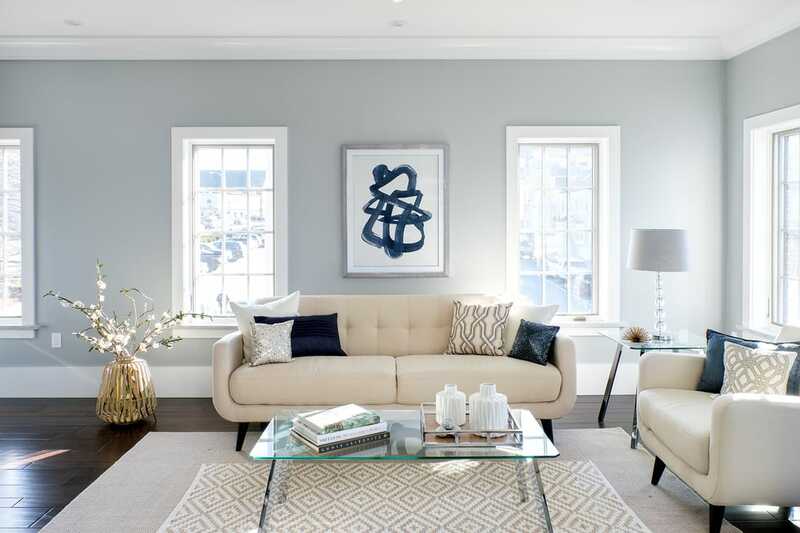 An expansive condo in downtown Portsmouth gets a mix of modern and glam elements in this staging project. This tiny "flip" gets a glam makeover and a colorful infusion. An elegant New Englander with an unusual floor plan is staged with simple elegant furnishings. Most of the time, our staging consultations take place in occupied homes where we use what is already there in order to make a real difference. Our most popular service consists of a thorough "walk and talk" consultation at your home. We are often asked "How much time and effort should we invest in preparing our home for the market?" The answer varies widely depending on the existing condition of your home. Whatever your situation, our consultations are specific to you, and include personalized and cost-effective recommendations that meet your timeline, budget, tolerance for change, and most importantly help your home stand out from the competition. This premiere service is ideal for the homeowner, real estate broker, developer, or builder who requires assistance in staging and decorating model home units or vacant properties. We specialize in pulling together rental or purchased furniture collections including lighting, art and accessories in order to visually represent the lifestyle associated with each property. As trained decorators, we understand how to match furnishings to a home’s architectural style and inherent personality – thereby enhancing each home’s image and overall impression. The resounding benefit of staging vacant spaces is the ability to give buyers an immediate sense of how life would be in their new home. If they can see it, they can imagine it. Download Spruce's Top 10 Staging Suggestions for a jump start to preparing your home for sale.